This is a gift of flowers that is simply bursting with glorious colour. There are hot pink germini blooms, lime green chrysanthemums, a sumptuous golden rose and not forgetting the bright orange lilies with their dark centres. With so much to enjoy, it's difficult to know what to admire first. 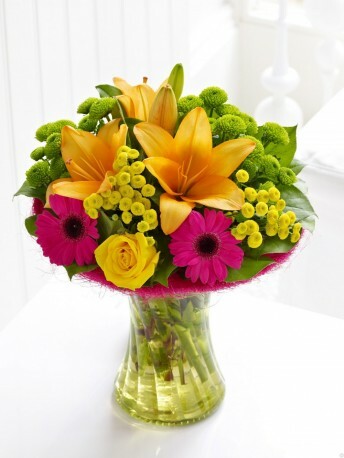 Featuring cerise germini, yellow large-headed rose, green chrysanthemums, orange Asiatic lily and yellow tanacetum with salal, in a lime curved glass vase with a vibrant sisal collar and presented in Interflora Gift Packaging.